People providing resources to people in need goes back to the earliest times of our nation. Throughout our organizations history volunteering has been a mainstay for us to get things done. Families Together is fortunate to have people who want to positively impact the lives of people in need. Our volunteers range from individual people to corporate organizations providing time and effort to help us further our mission of taking families from homelessness to home. If we were to list all of the things that we lean on our volunteers for, this blog would take all day to read. 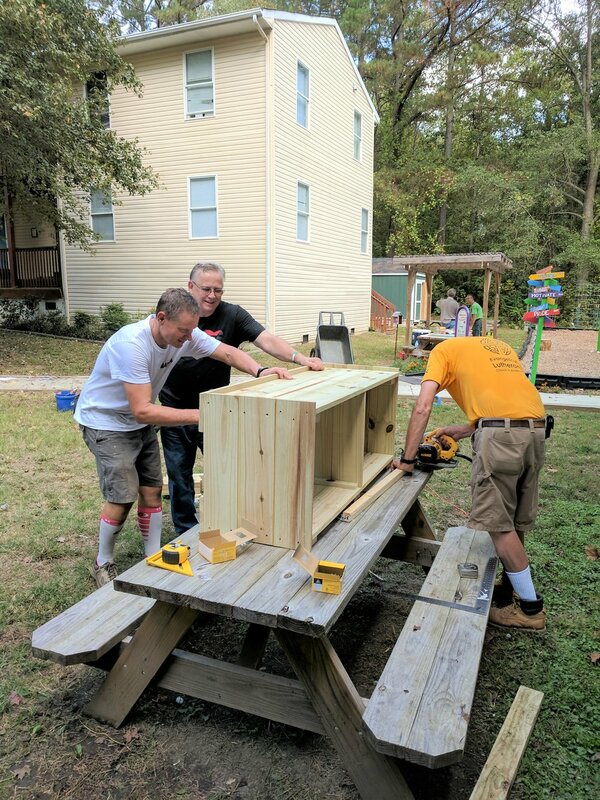 We are going to start with Tim Hiteshew who came with a team and finished building benches and cubbies for our units that families have and will find very useful. He also is our resident grounds keeper putting in many hours in the elements to keep our grounds looking great. We also have three awesome ladies representing St. Philip Lutheran Church, Sally Bowman, Stacey Carstens Bell, and Sandy Glass – go above and beyond for families experiencing homelessness by using their “elbow grease” to clean our Short-Term Family Housing apartment units after families move on to a better future in a permanent home in the community. With smiling faces and tons of enthusiasm, they come often at a moment’s notice to get the units ready for a new family to move in. We are so appreciative to have them as part of our family.